The investment tax credit (ITC), also known as the federal solar tax credit, allows you to deduct 30 percent of the cost of installing a solar energy system from your federal taxes. 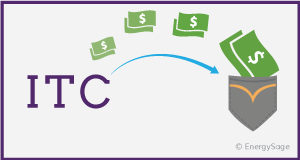 The ITC applies to both residential and commercial systems, and there is no cap on its value. The average EnergySage Solar Marketplace shopper saves nearly $9,000 on the cost of going solar as a result of the ITC. The ITC was originally established by the Energy Policy Act of 2005 and was set to expire at the end of 2007. 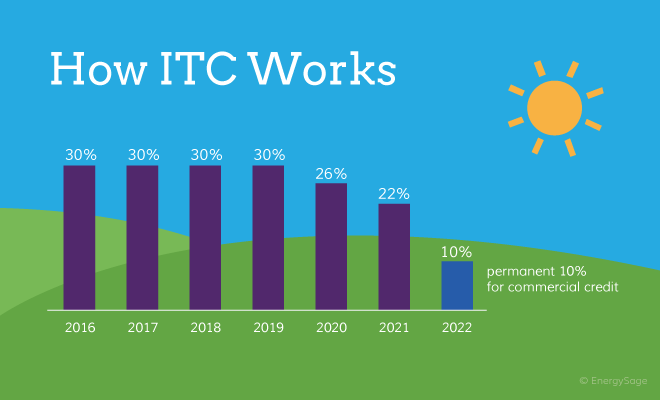 Thanks to the popularity of the ITC, and its success in supporting the United States’ transition to a renewable energy economy, Congress has extended its expiration date multiple times. Now, the solar investment tax credit is available to homeowners in some form through 2021. Here are the specifics. 2016 – 2019: The tax credit remains at 30 percent of the cost of the system. 2020: Owners of new residential and commercial solar can deduct 26 percent of the cost of the system from their taxes. 2021: Owners of new residential and commercial solar can deduct 22 percent of the cost of the system from their taxes. 2022 onwards: Owners of new commercial solar energy systems can deduct 10 percent of the cost of the system from their taxes. There is no federal credit for residential solar energy systems. In previous years, owners of new solar energy systems could not claim the tax credit unless their system was operational. Now, recent legislation allows homeowners to claim it as soon as the construction of the system begins, as long as the solar panel system is operational by December 31, 2023. As long as you own your solar energy system, you are eligible for the solar investment tax credit. Even if you don’t have enough tax liability to claim the entire credit in one year, you can “roll over” the remaining credits into future years for as long as the tax credit is in effect. However, remember that if you sign a lease or PPA with a solar installer, you are not the owner of the system, and thus you cannot receive the tax credit. How do I claim the investment tax credit? You claim the investment tax credit for solar when you file your yearly federal tax return. Remember to let your accountant know you’ve gone solar in the past year, or if you file your own taxes, simply use EnergySage’s step-by-step guide on how to claim the solar ITC.